I often get asked how I manage to read so many books while studying medicine. I almost always answer, "I make time for it." But I know, at the back of my head, that I'm simply not reading enough. Compared to some people I know, my older brother among them, the amount of my reading hardly makes for a comparison. I guess you can call me the reading type of person. Most of my time online is spent reading written words—the blogs I follow, the newest short story in the New Yorker, the Saturday poems in 3 Quarks Daily, among others. While waiting for my turn in the barbershop, I grab old, wrinkled, outdated newspapers. While paying my tuition fee in UP Manila, I catch up on the latest novel I've downloaded. After exams, I go home and have a book lull me to sleep. Reading is the only time, apart from sleeping, when I'm actually quiet. But many times I read other things at the expense of studying. When I was in elementary, my mother used to tell me, "Don't ruin your eyes with those books. You'll get sick of them by the time you enter med school." She was partly right about that. You see, in medicine, we never run out of things to read. 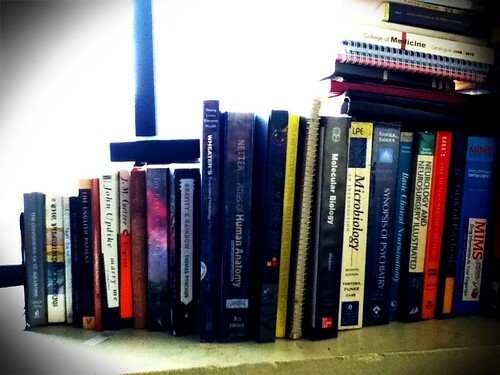 There will always be books and journal articles and notes to run through. With the fast information turnover, week after week, we can hardly catch up. But she was partly wrong, too. I didn't get sick of books. I call to mind the neurosurgeon Dr. Henry Perowne, a major character in Ian McEwan's Saturday . He hardly read any fiction, having spent most of his life reading medical textbooks. But his daughter, a literature major, if I'm not mistaken, would send him reading lists to force him to expand his book choices. But why do I choose read other materials anyway, even if I know it may take a portion of my study time? The first reason that comes to mind is: I like it. I read for pleasure. I love the idea of hearing a person's thoughts, immersing into his ideas, and making them play out into my own. I love the feeling of joyful solitude that comes with the habit: you cannot make sense of what you're reading if you're chatting with someone at the same time. You have to hear yourself. Though this may sound crazy to others, I make reading Harrison's Principles of Internal Medicine enjoyable by imagining myself talking to patients, hearing them cough, or pretentiously prescribing medications. That way, I can remember things better for exams. Many times this technique works. The second reason is that I learn a lot of from the books I read. This doesn't always happen in the strictest sense. Some books aren't meant to teach but simply to entertain. But even in entertainment there is learning. I make this the second reason because learning is a necessary overflow of pleasure. I'm speaking in generalities here, of course, but isn't it true that one is destined to gain something from a work of literature he delights in? The common misconception is that you have to be smart to read books. You have to know big words. You have to be good in language. I say it's the opposite: you have to read books to be smart. But this is not just the academic kind of smart, but the mental discipline of making sense of the written word, looking at its deeper meanings, and applying these things in your own life. The third reason is growth. I grow when I read. I grow in vocabulary. I grow in experience. I grow in knowledge. We can profit from literary giants who have lived hundreds, even thousands, of years ago, in the same manner that we can get something from the latest bestselling authors. Ultimately this is the reason why people must read: to grow. This especially rings true in Christianity. We read in the Bible how the Psalmist delights in the Law of the Lord, calling it sweeter than the honey and the honeycomb, referring to it as something that refreshes the soul. We must study God's Word to grow in our love for and knowledge of Him. My friend, Katrina, a bookworm herself, gave me the link to a NY Times article written by a first-year resident. The article stresses the value of reading non-medical books—in this case, fairytales—in the practice of medicine. The practice of medicine bestows the sacred privilege to ask about the unmentionable. But what happens when the door to Bluebeard’s horror chamber opens, and the bloody secrets spill onto your aseptic field of study? How do you process the pain of your patients? I found my way back to stories. The Grimm fairy tales once seemed as if they took place in lands far, far away, but I see them now in my everyday hospital rotations. I’ve met the eternal cast of characters. I’ve taken down their histories (the abandoned prince, the barren couple) or seen their handiwork (the evil stepmother, the lecherous king). Fairy tales are, at their core, heightened portrayals of human nature, revealing, as the glare of injury and illness does, the underbelly of mankind. Both fairy tales and medical charts chronicle the bizarre, the unfair, the tragic. And the terrifying things that go bump in the night are what doctors treat at 3 a.m. in emergency rooms. So I now find comfort in fairy tales. They remind me that happy endings are possible. With a few days of rest and proper medication, the bewildered princess left relaxed and smiling, with a set of goals and a new job in sight. The endoscopy on my cross-eyed confidante showed she was cancer-free. Healing, I’m learning, begins with kindness, and most fairy tales teach us to show kindness wherever we can, to the stooped little beggar and the highest nobleman. In another year, I’ll be among the new doctors reporting to residency training. And the Brothers Grimm will be with me. If you're a medical student—and if you chance upon this blog, it's highly likely that you are—then I suggest you immerse yourself in non-medical books. It's not as boring as it sounds. Meanwhile, I may have to go back to Suzanne Collins' Mockingjay waiting on my bed. I want to finish it before Monday. Listen to my podcast here. Joke time talaga. I say it's the opposite: you have to read books to be smart. -this is the same mantra that my father has. hehe! Love this kuya! I was nodding in agreement the whole time I was reading this. The day I give up reading fiction is the day I die. When I was in elementary, my mother used to tell me, "Don't ruin your eyes with those books. You'll get sick of them by the time you enter med school." -- Wow! Tita Shirley has always known you'll be in med school! Kuya John, she has her ways. Haha.